There wasn't much thrifting this weekend, instead I spent time organizing chaos. The house is clean again, no boxes in sight! It's so surreal and comforting! I even rearranged some fun new thrifted item vignettes that I'll have to show off later! The boat above was a gift from Meredith of Lemoree! Every time I saw her I told her how much I love the boat paint by number in her booth at Southern Crossing Antique Mall and this week she actually gifted it to me! Thank you Meredith! 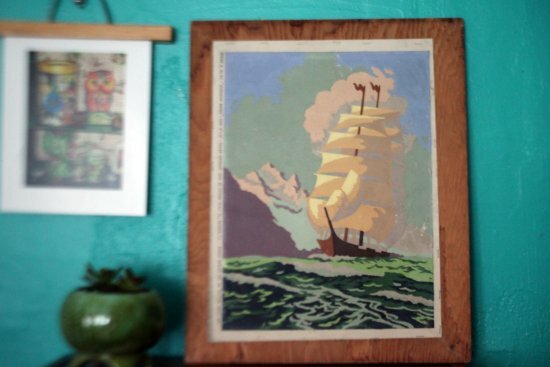 It's the new favorite vintage boat piece! My favorite find is actually from a week ago or so ago, it's this cute glass tanuki. Note the fun disproportionately large...anatomical features! I wonder what they item was originally used for and what era its from. It has a hole in the back of its head like a vase and a hole in the front under its chin. For now he's going to chill with the kokeshi maidens! Watch out ladies, there's a new guy in town! I also found this beautiful blue scotch print soup thermos. I pack soup for lunch all the time so I love having a variety of these to use. I've encountered many brown ones with this print but never blue ones. 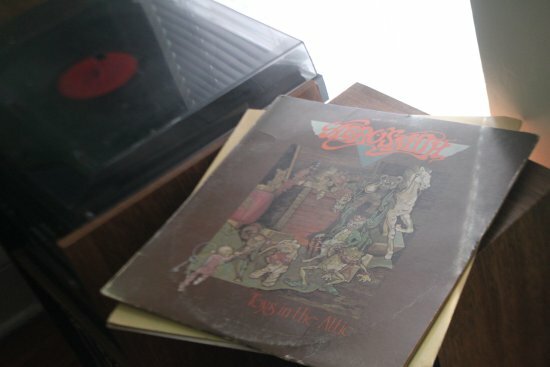 These records are from a yard sale, some classic Aerosmith, A Tribe Called Quest, and Barry White. All excellent! I'll listen to them when I can break away from my Prince records. I've been having a marathon with them, can't get enough! Love the Japanese dolls with the...Tanuki? Is that the animal or a name for this type of thing? I'm not sure being up there with the maidens is going to help his anatomy any though! Wow that blue plaid is something I've never seen before - definitely have come across the browns, in my youth, and at the thrift! That darn Tanuki...always getting into trouble! Lakota: Tanuki is the Japanese name for the "Japanese Raccoon Dog", they appear in lots of Japanese folklore and art, the enlarged balls are part of their legend/allure. They're so damn cute, I love them! so much fun! The thrmoses are outstanding! 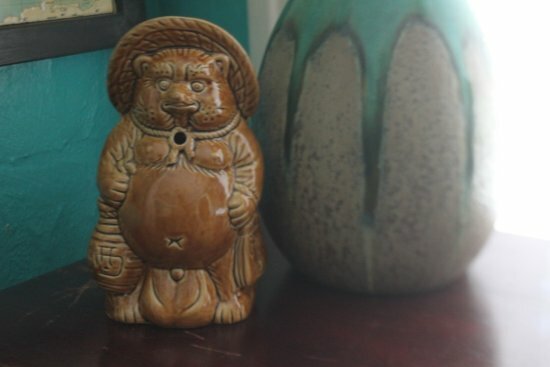 Without seeing the back I'd guess the Tanuki is an incense holder (stick goes in back, smoke comes out front). i bet the hole is for a straw - i think he's intended to hold drinks! what a cad - get you drunk and then take advantage of you. 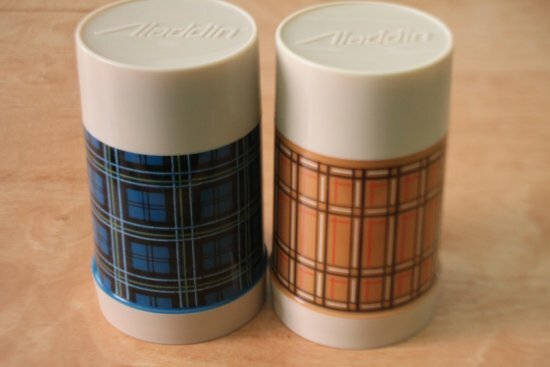 :-) LOVE the blue plaid thermos. i'm a sucker for plaid. I'm in Victoria BC (the provincial capital) for 3 days and have a list of thrift shops to hit, so i'll blog about those later this week! Or could he be to hold a ball of string? 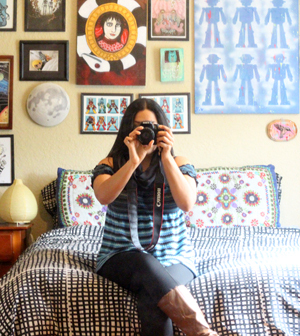 Angelika: Can't wait to read your blogs about the thrift shops you explore! Warmwoollenmittens: I think rope may have come out of the hole? Hard to say! That ship paint by number is fabulous! I have a big ship paint by number in my house too and love it! I am pretty sure that Tanuki is for holding a fruity drink, though I've never seen that shape before (or one with such, er, cojones!). Usually you see them in the shape of Buddha, and usually in white ceramic. 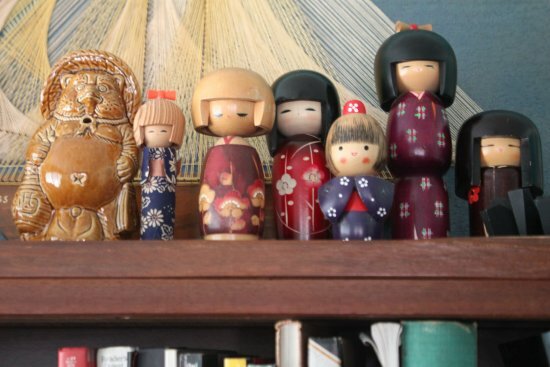 I love the paint-by-number and the Kokeshi dolls! I spent some time in Japan and have a few. Some of my faves are the mini ones I bought at "Temple sales." Hello! I just stumbled onto this article, because I found the same tanuki statue at a local antique store. On the tag it said "bear string holder." I knew it was a tanuki, not a bear...but I didn't know what a string holder was.